In fact, Mueller has pushed Gates on #Collusion/Conspiracy specifically. #PPS: Also, Gates likely knows more about Dana Rohrabacher — the former GOP member of Congress dubbed "Putin's favorite Congressman" — who's surfaced randomly in Russia investigation. He's met w/ Veselnitskaya, Assange, & members of Putin's inner circle. #NEW: Rick Gates is cooperating w/ Mueller’s probe into whether people from the MIDDLE EAST worked w/ Trump's campaign to influence the election. Specifically, Israeli Joel Zamel, his social media co. Psy Group, and George Nader, the Emissary to UAE + SA. #PREVIOUSLY: Last May, we learned about ANOTHER Trump Tower meeting in 2016, arranged by Erik Prince. Don Jr. met with Israeli Joel Zamel, owner of Psy Group, and George Nader, Emissary to UAE + SA, about a social media campaign to influence the election. Counterintelligence investigations are by their very nature complex, nuanced and methodically slow, all facts that today’s news media outlets seem to ignore as they chronicle the Russia collusion probe. The past week provided fresh examples of how journalists endlessly seeking to portray the Russia probe in black-and-white terms can misinform the public through omission, cherry-picking or lack of context. So why is this such an important development? 1. 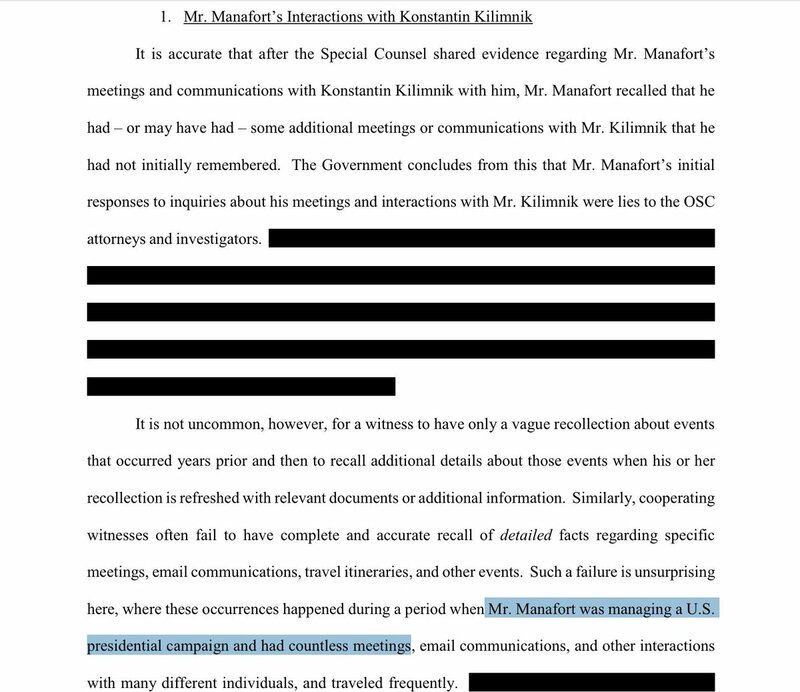 HUGE piece of news from MUELLER's probe that Manafort's lawyers inadvertently spilled in a court document they failed to properly redact. MANAFORT SHARED POLLING DATA WITH KILIMNIK. 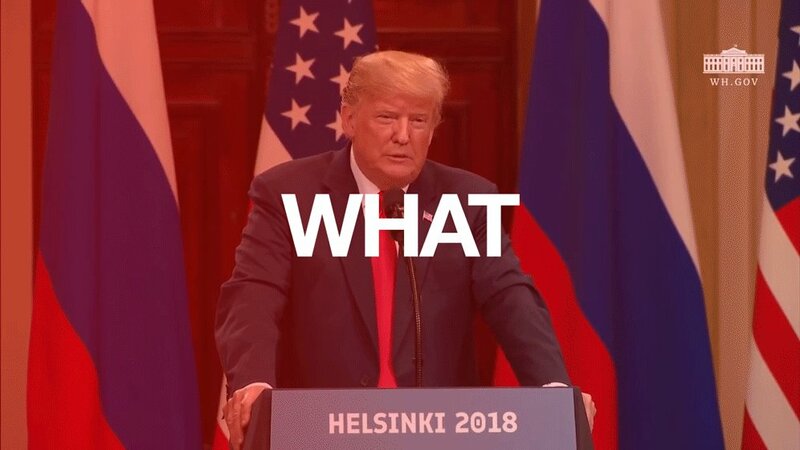 Meaning a Russian intelligence agent. Oopsie. 2. 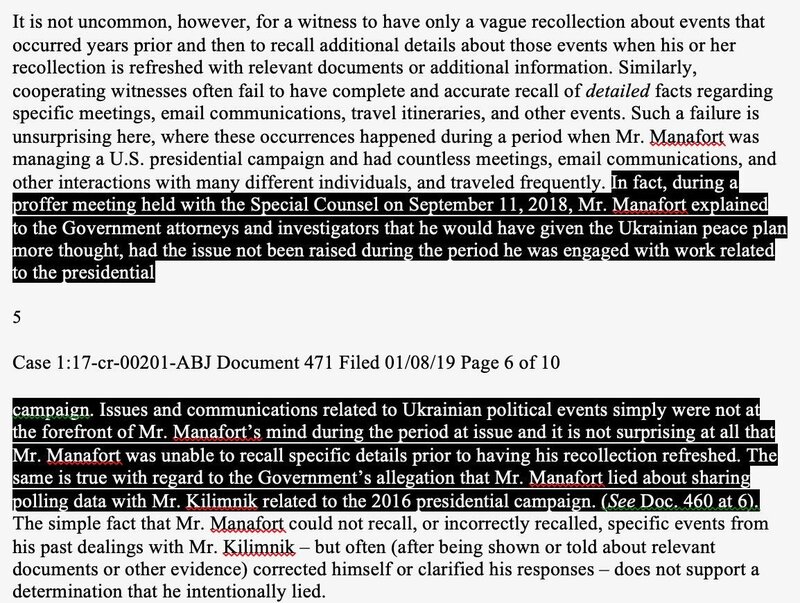 "The doc by Manafort’s lawyers attempts to redact several key details, but mistakenly left them legible. The most important detail is that Manafort, who served as Donald Trump’s 2016 campaign manager, shared polling data with Konstantin Kilimnik, a Russian intelligence agent." 3. "The detail comes up because the special counsel is charging Manafort with omitting this fact when he cooperated with them, while Manafort’s lawyers maintain he merely forgot about it." oh HEY! I FORGOT I conspired with a Kremlin rep to manipulate the US election! Silly me! Manafort is *not* requesting a hearing on whether he lied to Mueller. Manafort lawyers say he's suffering from "severe gout" as well as "depression and anxiety"
"He owed us a lot of money. 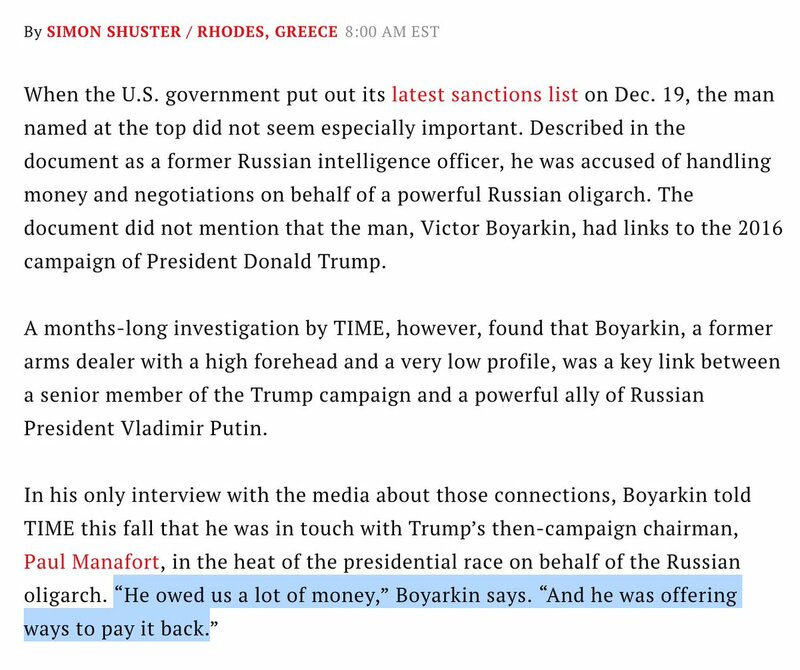 And he was offering ways to pay it back"—Viktor Boyarkin on #Manafort. Yet another Russian spy with leverage over the Trump campaign. This corroborates earlier reports of "private briefings" to Putin pal Deripaska…who was just gifted sanctions relief. 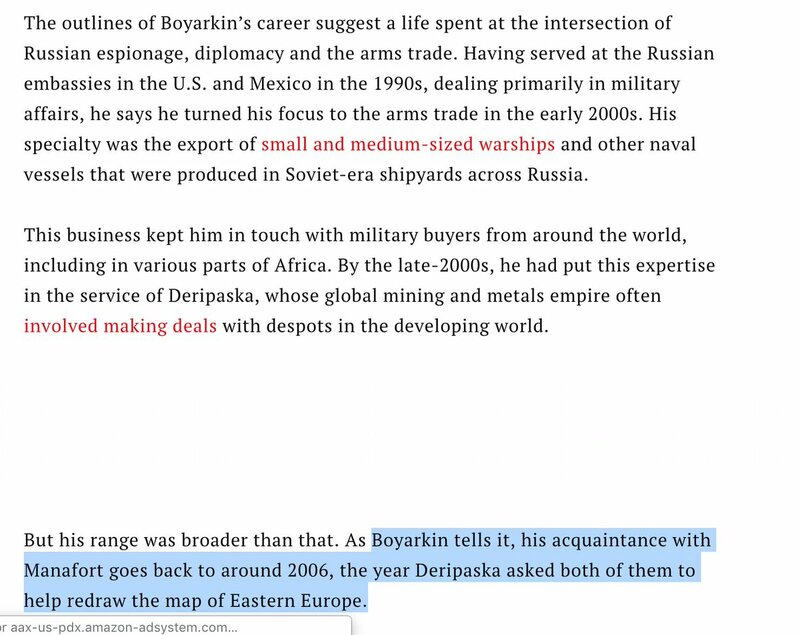 Boyarkin did more than collect Deripaska's debts. He worked w/ Manafort since 2006—"the year Deripaska asked both of them to help redraw the map of Eastern Europe." 😱Manafort has consistently worked for Putin/Russia's interests & against US interests. In 2016, on Trump campaign.